Do you dream of being the next James Blunt, Arctic Monkeys or Beatles? Can you play an instrument, but have difficulty coming up with song ideas? Do you simply want to impress your partner by writing a song for them? With a Crash Course Songwriting, you can do all this and more. 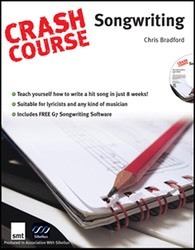 Crash Course Songwriting is a practical, engaging and interactive course to the craft of songwriting. It is suitable for the absolute beginner as well as the more experienced songwriter who wishes to develop their abilities. Whether you want to learn how to write better lyrics, compose catchy melodies or break creative blocks, this book will help you become the songwriter you want to be. This is the first book to provide a progressive and all-encompassing home course with supportive software and dedicated website to the craft of songwriting.